It was a wild and tension-filled night at Fenway Park, where the Boston Red Sox hosted the Los Angeles Dodgers in Game 2 of the World Series. Already up 1-0 in the series, the Red Sox pulled out a win on Wednesday night due to some costly mistakes by the Dodgers. Boston saw their opportunity, and seized it to take a 2-0 World Series lead. The Red Sox would land the first strike in the bottom of the second inning. After shortstop Xander Bogaerts doubled to centerfield, second baseman Ian Kinsler singled to left. Bogaerts scored to give the Red Sox a 1-0 lead. They wouldn’t hold that lead for very long. Red Sox pitcher David Price got the start in this game, and started off hot. Price had three strikeouts going in the first 3 innings and did not let a baserunner get past first base. Then the fourth inning came. Price gave up back-to-back singles to David Freese and Manny Machado, and then walked Chris Taylor to load the bases. Matt Kemp walked up to the batter’s box next. He hit a sac fly to centerfield, scoring Freese. A few pitches later, Yasiel Puig singled to centerfield to bring Machado home too. In the blink of an eye, Boston went from up 1-0 to down 2-1. Price struck out Austin Barnes to end the inning and stop the bleeding. The damage was done, but it wouldn’t last forever. In the bottom of the 5th inning it would be the Dodgers that started bleeding. Dodgers pitcher Hyun-Jin Ryu started Game 2. It was not his best outing. In the bottom of the 5th inning Ryu loaded the bases on two singles and a walk. Ryu was subsequently taken out and replaced by Ryan Madson. The next batter up was Steve Pearce. Madson walked him. That walk scored a tying run for the Red Sox, but they weren’t done yet. Two pitches later, J.D. 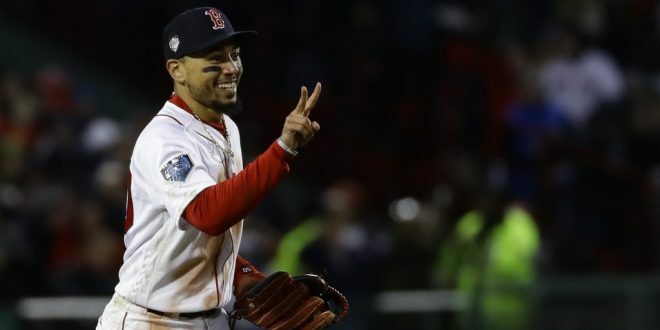 Martinez hit a two-out single two right field that scored both Mookie Betts and Andrew Benintendi. 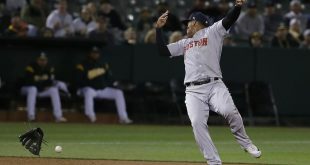 Just as quickly as they lost the lead, the Red Sox had it again. They were up 4-2 heading into the 6th inning. With just a few critical pitches, Ryu and Madson had placed their team in a hole. Now they had to try and get out of it. David Price would pitch one more inning. Those Dodger batters went three up, three down. Despite a less than ideal postseason career, Price pitched excellently and put his team in a position to win. He finished the night with 5 strikeouts and only 3 hits. 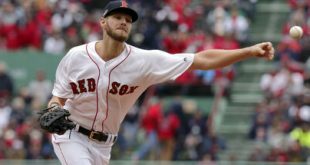 A pitching combination of Joe Kelly, Nathan Eovaldi, and Craig Kimbrel would take the Red Sox through the next three innings. Coupled with outstanding defense, the Red Sox were able to shut down the Dodgers for the rest of the night. The moment that sums it all up: a spectacular leaping catch from Andrew Benintendi. The Boston Red Sox are now up 2-0 in the World Series against the LA Dodgers. If they can win the next two games, the Red Sox are World Champions. Game 3 is on Friday at 8:09 p.m. at Dodger Stadium in Los Angeles.